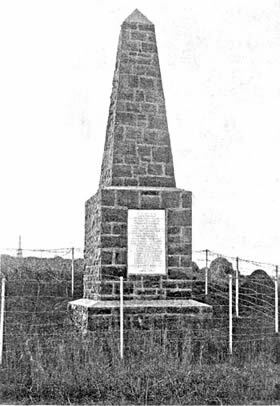 A Memorial was erected to the memory of the men from the 1st Battalion, the Devonshire Regiment who fell on 6 January 1900 at Wagon Hill, Ladysmith. It stands on the exact spot where the charge took place. The Memorial to those who died on 6 January 1900. FIGHT ON 6th JANUARY 1900. Thanks to Mildred Dooner, who during the Boer Wars, painstakingly collected and published, in 1903, all the details she could find of commissioned officers killed during the various campaigns in South Africa, information about them is easy to find. Not so the non-commissioned men. Throughout the South African Campaigns, they were invariably indexed only with initials and the name of their regiment (not the battalion) by the Army. Service numbers were not recorded in this index. Without Christian names and ages, tracking down individuals calls for real detective work and even then, 100% accuracy cannot be guaranteed. Captain William Bautcher Lafone of the 1st Battalion, the Devonshire Regiment. Son of Alfred Lafone of Hanworth park, Middlesex. Born in 1860. Killed 6 Jan 1900 aged 40. Lieutenant Henry Norman Field of the 1st Battalion, the Devonshire Regiment. Son of Mr. Justice Field formerly of the Calcutta High Court. Born in 1873. Killed 6 Jan 1900 aged 27. Lance Corporal Joseph Pigeon of the Devonshire Regiment. Believed to be the step-son of John and Elizabeth Bennett, born in Exmouth in 1871. Died of wounds received 6 Jan 1900 aged 29. Lance Corporal William Drummond Pratt of the Devonshire Regiment. Believed to have been born in Stoke Damerel in 1874. Killed 6 Jan 1900 aged 26. Lance Corporal Albert G. Vern of the Devonshire Regiment. believed to be the son of Mary Ann Vern, born in Crediton in 1875. Killed 6 Jan 1900 aged 25. Private T. Bamsey. Killed 6 Jan 1900. Private A. Bevan. Died of wounds received 6 Jan 1900. Private J. Bibb. Killed 6 Jan 1900. Private W. Brown. Killed 6 Jan 1900. Private A. Curtis. Killed 6 Jan 1900. Private W. Davidson. Killed 6 Jan 1900. Private William Discombe Fair of the Devonshire Regiment. Believed to be the son of William and Eliza Fair, born in Cullompton in 1873. Killed 6 Jan 1900 aged 27. Private W. Harvey. Died of wounds received 6 Jan 1900. Believed to be Private Ernest Benjamin Hornsby who was born in East Stonehouse in 1874. Died of wounds received 6 Jan 1900 aged 26. Private Frederick Litton of the Devonshire Regiment. Believed to be Private Harry Marden, born in Rame, Cornwall, in 1876. Killed 6 Jan 1900 aged 24. Private W. Newcombe. Killed 6 Jan 1900. Believed to be Private Frederick William Page who was born in Exeter in 1881. Died of wounds received 6 Jan 1900 aged 19. Private G. Roper. Killed 6 Jan 1900. Private J. Seager. Killed 6 Jan 1900. Private W. Woods. Died of wounds received 6 Jan 1900. Lieutenant Claude Ernest Myln Walker, on attachment to the 1st Battalion, the Devonshire Regiment from the Somersetshire Light Infantry. Born in December 1875. Killed 6 Jan 1900 aged 25.